About 73 million Americans — nearly half of them women — have hypertension (high blood pressure), a condition that propels blood too forcefully through blood vessels, increasing the risk of heart attack, heart failure, stroke, and kidney damage. If you have hypertension or borderline hypertension, you should be checking your blood pressure at home on a regular basis. That's the major recommendation in a joint statement from the American Heart Association (AHA), the American Society of Hypertension (ASH), and the Preventive Cardiovascular Nurses Association (PCNA). The expert panel that issued the statement was chaired by Dr. Thomas G. Pickering of Columbia University. The statement itself was jointly published online May 22, 2008, in the journal Hypertension and the Journal of Cardiovascular Nursing and in print in the Journal of the American Society of Hypertension (May 2008) and the Journal of Clinical Hypertension (June 2008). Although other guidelines on managing hypertension have endorsed home blood pressure monitoring, this is the first time experts have given detailed advice about its use. The statement, which also urges that the cost of home monitors be reimbursed, marshals evidence that regular home monitoring gives a more accurate picture of an individual's blood pressure than readings in a health care setting or merely occasional, casual monitoring (at home or in drugstores, for example). Regular, daily home blood pressure checks are also better than office-based readings alone for identifying the risk of a heart attack or other cardiovascular event, and for judging the effectiveness of a medication or other pressure-lowering strategy. Also, home blood pressure monitoring involves people more in their care, which can bolster their efforts to make behavior changes and take their medications. Readings taken in health care settings don't always reflect "true" blood pressure, that is, the average over an extended period of time. For one thing, blood pressure fluctuates over the 24-hour cycle, depending on a person's activities (see "Blood pressure fluctuates throughout the day"). Also, some people have what's known as white-coat hypertension — their blood pressure spikes upward in a physician's office or other health care setting. Others have "masked hypertension" — normal in a health care setting but high at home. Home monitoring can also provide a better sense of how well a medication or other blood pressure–lowering strategy is working. 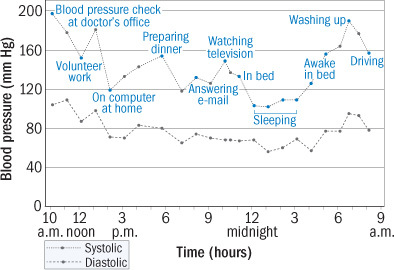 This graph shows blood pressure changes in a 73-year-old woman over a 24-hour period. They were recorded using an ambulatory blood pressure monitor, a technology clinicians use to investigate possible cardiovascular problems. A spike in the woman's blood pressure at her clinician's office in the morning suggests she may have white-coat hypertension. Her average blood pressure was 141/77. In adults, hypertension is defined as a systolic pressure (the upper number) of 140 or greater or a diastolic pressure (the lower number) of 90 or greater (see box below). Another 60 million American adults have prehypertension (a range of 120 to 139 for systolic pressure or 80 to 89 for diastolic pressure). Home blood pressure monitoring could help clarify their situation and establish the need for treatment, according to the new advisory statement. Buy an oscillometric monitor (one that doesn't require the use of a stethoscope). It should work with a cuff that fits on the upper arm; wrist and finger models are not recommended. Some oscillometric monitors are automatic; with others (see photo), you have to squeeze a bulb to inflate the cuff. Be sure that the one you buy has been validated according to standard protocols. Your clinician may be able to recommend one, or you can check the lists of upper-arm monitors for home use at the Dabl Educational Trust Web site, www.dableducational.org, or the Web site of the British Hypertension Society, www.bhsoc.org/blood_pressure_list.stm. Home monitoring devices are available at drugstores and medical specialty shops, as well as through catalogs and on the Internet. They range in price, from around $50 to $100. Photo courtesy of A&D Medical, Inc.
After you buy the blood pressure monitor, take it to your clinician's office to check its accuracy and your technique. Discuss with your clinician how she or he would like to incorporate home blood pressure readings into your care. To determine your starting blood pressure values, use the monitor for a week, first thing in the morning and before going to bed at night. Each time, rest for five minutes in a seated position (see illustration) and then take two or three readings at least one minute apart. Keep track of all your readings. At the end of the week, discard the first day's readings: an average of 12 morning and evening measurements should give your clinician an idea of your true blood pressure and provide a solid basis for treatment decisions. 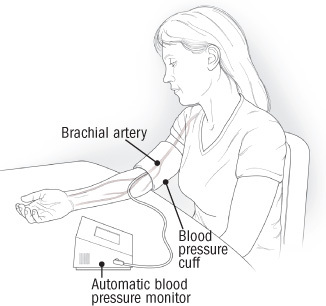 Upper-arm monitors measure blood pressure in the brachial artery, which passes along the inside of the elbow and continues up the arm. This is the type of monitor you should use; a wrist or finger monitor is not as reliable. Sit quietly for five minutes, with your feet on the floor and your back well supported. Your arm should be resting on a flat surface, with the upper arm at the level of the heart. Position the cuff so that its midportion lies over the artery. (Some cuffs are imprinted with an arrow to help with positioning.) Most people find it easier to measure blood pressure in the nondominant arm. Avoid caffeine, alcohol, smoking, and exercise for at least 30 minutes before taking your blood pressure. Work with your clinician to determine how often to conduct home blood pressure monitoring. Keep in mind that blood pressure readings are highly variable, so an individual spike or dip should not be a cause for concern. For a link to the AHA/ASH/PCNA statement and more information about monitoring and managing your blood pressure, visit the American Heart Association Web site at www.americanheart.org/bptools.